One thing that is quite clear in my opinion is the extent to which the split between Sunnis and Shiites in the Middle East is affecting tensions in the region. Whilst the casual observer might think about the idea of a monolithic Islamic world, that is certainly not the case. As we had explained in a previous post, there are two major sects within Islam, Sunni and Shia. 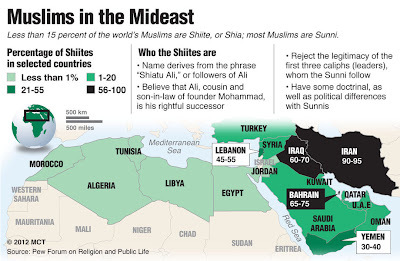 Although the split is not exact, it is fair to say that in the Middle East most countries could be classified as majority Sunni or majority Shia. As Sunnis constitute over 85% of the Islamic world globally, there are still some key countries in the Middle East with predominantly Shia populations, most notably Iran. To give readers a better feel for Sunni and Shia concentrations in the Middle East, there are a couple of maps included in the post to help visualize the discussion. 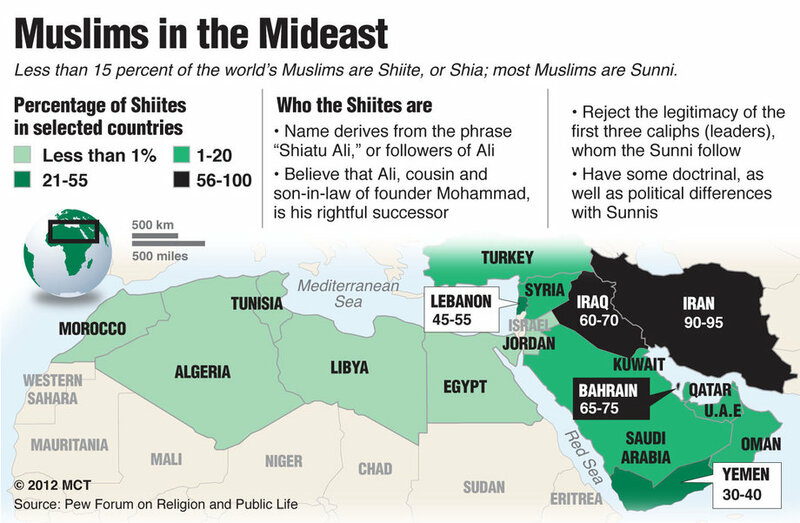 Now, we do not want to overstate the split between Sunnis and Shia in the Middle East. As Muslims, they generally share more similarities than differences, and when not disturbed by outside forces or those with political agendas Sunnis and Shia generally live quite comfortably with each other. As we had explained in a previous post on Syria, however, there is no question that the split between Sunnis and Shiites is influencing events in the Middle East to some extent.